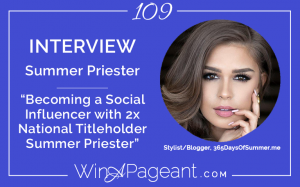 In this episode, Alycia Darby interviews Summer Priester, Stylist/Blogger of 365DaysOfSummer.me. Born and raised in Aiken, South Carolina, Summer Priester has proven that even a small town girl can accomplish her dreams. Summer has become a two-time National titleholder, the former Miss United States 2015 and former Miss High School America 2011. She is a 2016 graduate of the University of South Carolina with a bachelor degree in Fashion Merchandising. She is currently a professional Fashion stylist/image consultant, model, and blogger of 365DaysofSummer.me.